When we rise from below to above on the spiritual ladder, I am renewed all the time. So in what way is my “second self” different from the “first self”? In that I perceive the Creator, my Maker, in all these levels? In the previous level I was found under the influence of particular forces and also in the new level. 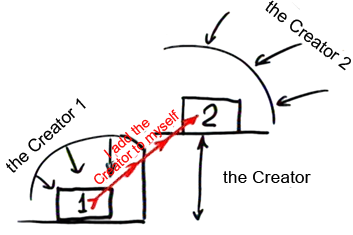 Yet the difference between the levels is that in the previous level I had a “first Creator” and in the new level I have a “second Creator.” The ascent from level to level is in the perception of the Creator and not just that I perceive myself. I perceive myself in a more primitive form if I rise from below to above. Yet in addition to this, I perceive the Creator, I attach Him to me. Which is to say, the “second creature” is different from the “first creature” in that he adds the Creator to himself, to his essence, and therefore he transforms into a great man, into an Adam relative to his previous state, he becomes more like the Creator. It follows that spiritual attainment is not involved with the addition of greater feelings and intellect, rather it is qualitative. New Kelim are formed, desires are renewed and reorganized all the time. From time to time the structure of the Creator penetrates more and more into the creature and organizes him according to His image. Because of this, we begin to think otherwise, to feel, to accept other decisions, we look at the world in a different way. Everything is changed within us. The substance seemingly is left unchanged, although it gets new information. This is the ascent from below to above. The person is changed all the time, so that nothing of the previous state is left for him, not even memories. The desire for pleasure is left, yet it gets new complexity, division, structure, and organization. To this substance is added the structure of the Creator every time, meaning, the characteristic of bestowal and love. The connection between all the parts causes changes and influences the structure itself. It is possible to compare this to a computer that is rebuilt yet is not changed in itself too much. Only a little memory, processing speed, and clock signal frequency is added, yet apparently the hardware, the machine is left the same, only it becomes more sophisticated, complex, faster, and responsive, which is to say it becomes more sensitive. Inside, those zeros and ones still alternate, yet with a higher speed than before. Within these zeros and ones a new program acts, a new connection that changes the quality of the substance completely. The program establishes everything and controls the substance. The machine itself, the “metal” is unimportant—what is important is the program that works inside. Our ascent from below to above involves a more sophisticated program.